​Surf Dog Ricochet is an internationally renowned, award winning surf dog who has become an inspirational phenomenon, philanthropic role model, internet sensation, fundraising marvel, community advocate, goodwill ambassador, and muse to millions! Surf Dog Ricochet advocates for many human interest initiatives including anti-bullying, equality, animals, the disabled community, individuality, crisis situations, accepting others for who they are, adaptive surfing, cancer, childhood cancer and many more. The video below shows how Ricochet's SURFice dog work began. ​It's been viewed by more than ​14 million people! "Beyond Belief" ​on the Oprah Winfrey Network. ​ Surf Dog Ricochet was featured on ESPN's Sports Center with several kids with special needs she surfs with. ​In 2009, Surf Dog Ricochet chose her own life purpose by unexpectedly jumping on a surfboard with 14 year old quadriplegic surfer, Patrick Ivison. The plan was for her and Patrick to surf on the same wave, but on their own boards. They rode a few waves like that, but then one time, when they got to the beach, she jumped off her board, and onto Patrick's. She was proclaiming to the world... I want to surf WITH Patrick on the same board. Tandem! ​Everyone put their trust in Surf Dog Ricochet and we tried it. She instinctively counter-balanced the board as they rode to shore, and history was made! Click the video to the left to view the ride. Prior to Surf Dog Ricochet there were no dogs committed to adaptive surfing. As such, she became the Canine Ambassador for Surfers with Disabilities®. She’s also the only SURFice dog® on the planet who provides therapeutic assistance while creating unique surfing experiences that empower kids with special needs, people with disabilities, wounded warriors & veterans with PTSD. She adapts her surfing style based on each individual’s disability, healing hearts and souls on every wave. Although surfing has been at the forefront of Surf Dog Ricochet's work, it’s not the act of surfing that makes her interactions so life changing. Don't get me wrong, it's pretty magical to watch her instinctively adapt her surfing style based on each individual's disability. And there have been some tremendous life-altering experiences in the ocean. But, it's her compelling ability to make immediate, heart-to-heart, soul-to-soul connections that allow for remarkable healing interventions… She balances boards, and lives! As a service dog trainer, our Executive Director, Judy Fridono had Surf Dog Ricochet’s life planned out from the moment she was born into our 501(c)3 non-profit organization, Puppy Prodigies. She was to be a service dog for a person with a disability. The only thing that was left out of the plan was Ricochet. She had plans of her own. As a puppy, she was a brilliant, enthusiastic learner. But, at 14 weeks of age, she lost interest in training and shut down. We tried all kinds of things to motivate her again, but nothing worked. She also developed a propensity for chasing birds which could be a risk to a person with a disability. We were both frustrated. Then, fifteen months into her training, Ricochet was released from her service dog role. The presumed dead end became a journey of infinite possibilities when Judy finally embraced her true calling and amazing things began to unfold. ​Surf Dog Ricochet’s life purpose is to achieve her highest surfing paw'tential and to serve in the role of an assistive aid to persons with disabilities both in and out of the water. Her objective is to act as an ambassador and live a lifestyle of helping others by pawing it forward while raising awareness and funds for human/animal causes. Acting as a catalyst, our goal is to motivate and inspire others to find their unique life purpose and to help people understand the sentience of dogs. Surf Dog ​Ricochet started as a surfing dog when she was eight weeks old on a boogie board in a kiddie pool. ​At fifteen months, she entered her first surf dog competition and won third place! From there, she entered and placed in the top three winning positions in most contests she entered. In 2014, she stopped competing to focus exclusively on adaptive surfing. However, she still surfs for fun, media and promotion. ​Once we saw Surf Dog Ricochet in the ocean that first time she surfed with Patrick, we knew adaptive surfing was her life calling. Although we never taught her to surf with a disabled person, she intuitively knows how to adjust her surfing style based on their disability. For instance, if the person is lying on the board, Surf Dog Ricochet stands on the back. If they are sitting, kneeling or standing, she’s on the front of the board. Often kids who don’t have physical disabilities use her back end to hold onto as they stand up. ​Since then, she’s surfed with hundreds and hundreds of kids and adults with varying disabilities. Surf Dog Ricochet is an official member of Team USA who is competing in the International Surfing Association's Adaptive Surfing Championship. This world championship brings surfers from around the world who have physical challenges to display their talents in a world-class competition. It began in 2015, and she was given the privilege to surf with Patrick Ivison in the Expression Session that year. She has been supporting adaptive athletes since 2009. ​Surf Dog Ricochet has been blessed with extraordinary and powerful gifts. And because they've been nurtured, she has an exceptional level of healing mastery. People resonate with her and are drawn to her presence and energy. 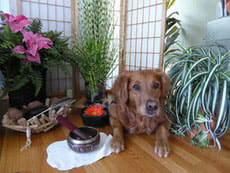 She's able to transform their blockages, painful memories and physical ailments. She can dissolve their pain and trauma. She releases their fear and reduces their hypervigilance. She intuitively and empathically alerts and responds to their emotional and physical changes which allows for profound paws-on healing interventions. She especially helps children with autism and military with PTSD come out of the dark corners of their emotions to new pathways of free-spirited living. Surf Dog ​Ricochet’s video “From Service Dog to SURFice Dog®”, has over 14 million views on YouTube and Facebook. It creates an incredible amount of positive energy and exposure. The attention wasn't expected, but we re-direct it to causes that need it. For instance, having media at the Spinal Muscular Atrophy surf session resulted in some video footage being posted on Facebook. Over 3 million people saw that footage. That is 3 million people who now know what SMA is! The following videos illustrate the ways in which Surf Dog Ricochet uses her surfing expertise and paws-on healing to help others. It includes examples of her empathy, mirroring, alerting, intuition, telepathy and spiritual healing. In the military, a battle buddy is your battlefield partner with whom you accomplish a common mission. Battle buddies are always ready to assist one another. Surf Dog Ricochet’s battle buddy is Staff Sergeant Randy Dexter. ​Using the healing power of a dog in the fight against PTSD, Ricochet was the catalyst that helped empower Randy to gain back his independence. She also raised $10,000 to fund a service dog for him. Because Randy’s recovery is so remarkable, we created the PTSD Battle Buddy Initiative to help other veterans. Every 65 minutes a veteran with PTSD dies by suicide. The video below shows what happened when Randy met Ricochet at minute 64. Our Waves of Empowerment program takes Surf Dog Ricochet's surf therapy, ocean therapy, paws-on healing and pawing it forward initiatives to the next level. It’s about inspiring and empowering military with PTSD and kids with special needs to help themselves by helping others. These are individuals that Surf Dog Ricochet has previously surfed or worked with, who are now volunteering to help the next wave of disabled surfers get on board with her! ​The transition from service member to veteran can leave many with no sense of purpose after having such crucial jobs in the military. Through this unique model, we’re able to renew their spirits and give them a sense of purpose. 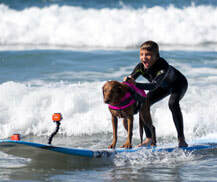 When kids with autism are allowed to help other kids surf with Surf Dog Ricochet, it gives them a sense of worth. Their self-confidence blossoms and their accomplishments are endless. Just imagine how it makes a child feel to be independent and responsible for the well-being of a dog! This is what Waves of Empowerment is all about. On the other paw, military with PTSD have anxiety in social situations, and often withdraw and isolate themselves because they feel anxious in social situations. 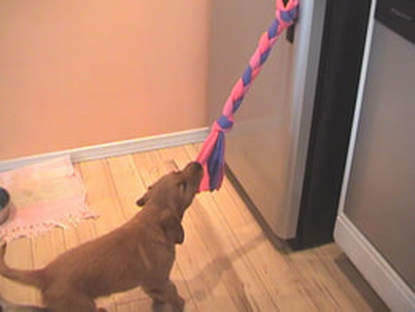 But, when they’re helping a puppy become socialized to a myriad of environments, they are helping themselves too. This initiative brings service and therapy dog puppies from birth through advanced training together with veterans suffering from PTSD. Click here to learn more about this program. The world’s best adaptive surfers compete for individual and team medals. The competitors represent their countries and have the opportunity to come together in the spirit of fair competition. Surf Dog Ricochet is a dog who stayed true to herself despite the expectations of others. She stayed true to herself despite being sensitive, and not standing up for herself when bullied by other dogs. Ricochet goes to schools to bark about the work she does, and instills the concept of individuality and being perfect the way you are. For six weeks during the summer, the Autism Society San Diego holds a surf camp for kids with autism. There is a new group of kids every week. Surf Dog Ricochet surfs with the kids, but we present it to them as they are helping the dog surf. This gives them a sense of independence and empowerment. ​For one week each September, the VA holds an adaptive sports camp for disabled veterans. One of the clinics is surfing and Surf Dog Ricochet attends to surf and interact with the veterans. Friends of Bethany Hamilton hosts a retreat each fall to inspire, strengthen, and teach young female amputees to use their physical difference as a platform to shine a bright light to others! One of the retreat days is for surfing, and Surf Dog Ricochet has been invited to attend and surf with the girls. ​Surf Dog Ricochet has held over 100 fundraisers for more than 250 different human and animal causes. She has raised over $500,000… that’s a half million dollars! 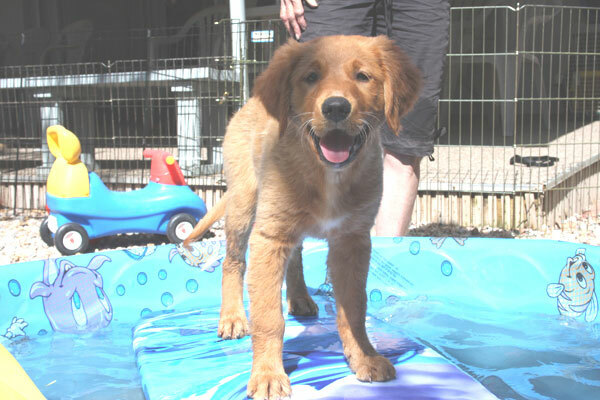 Surf Dog ​Ricochets SURFice dog® initiatives are part of our 501(c)3 non-profit, Puppy Prodigies. 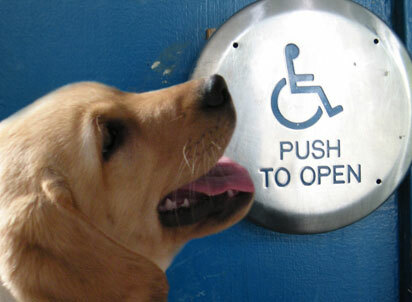 We train service dogs for people with disabilities. Our main focus is on puppies from birth until 7 weeks of age. This is the time their brains are still developing and we implement many different exercises to keep the neurons firing. We also serve as a resource to puppies born in many different circumstances, such as service dog organizations, shelters, rescues, etc. Because of Surf Dog Ricochet’s far reaching influence, she is an inspirational role model to millions of people from all walks of life. She inspires people to allow themselves and others to be who they truly are... without judgment or intention to change. To focus on what they CAN do, which allows for a celebration of amazing outcomes! She promotes staying true to yourself, anti-bullying, kindness, charity, philanthropy, and social responsibility, such as her video "It gets better: You're amazing just the way you are" for individuals who are bullied. Surf Dog Ricochet takes her SURFice job very seriously. You will rarely see her smiling on the surfboard. She takes responsibility for whoever she is helping. She doesn’t want a person going into environments they’re uncomfortable in. She tries to stop them from doing things that she thinks can be harmful based on the emotions she’s feeling from them. The best representation of this is a short, slow motion video that shows 8 year old West who has autism. They both jumped off the board as it neared shore. Ricochet didn't take her eyes of him until he made eye contact with her. Even though it was just a second of eye contact, she was assured that he was fine. Then, and only then did she run off to the beach. ​We literally have people’s lives in our hands and paws. We put people with disabilities on a surfboard in the ocean which is a liability in itself. But throw a dog in the mix and the liability goes up significantly. We take this very seriously as safety is our top priority. Therefore, we have liability insurance through our non-profit that covers Surf Dog Ricochet, participants and volunteers. But just as important, we have experienced water men and women with many years of surfing, disability and adaptation experience. When Surf Dog Ricochet made the decision to jump on a disabled boy's surfboard, she started a revolution! She is a trail blazer and leader of the pack. She was the first dog to make a commitment to assist surfers with disabilities. Thus, her Ambassadorship! Ocean Therapy program, working with the marines at Camp Pendleton. A volunteer organization that helps children with special needs build confidence and self-esteem through safe, fun, adventure activities. Surf and skate events for wheelchair athletes. Inspires over 10 million acts of kindness around the world. Navy Woof Walk: Raises funds for Navy Quality of Life Programs. Go to Surf Dog Ricochet's fundraising page to see a complete list of the 100 campaigns she's held for over 250 human and animal causes, raising over $500,000! Surf Dog Ricochet has been featured in hundreds of media sources all over the world, showcasing and raising awareness of her causes, SURFice dog work and surfing. Please visit her media page. ​for a comprehensive representation of media shes' been in, as well as magazines, books, billboards, movies, commercials, calendars, music videos, public service announcements, documentaries, halls of fame, celebrity meetings and more! Click here to view a whole bunch of photos! ​Surf Dog Ricochet also enjoys dock jumping, ball chasing, digging for gophers, chasing critters, lurecoursing, birds and squirrels! Click the donate button below to support Surf Dog Ricochet's work. ​Surf Dog Ricochet is also slated to be one of five dogs featured in an IMAX film Superpower Dogs. This 2-3 year project will give us the opportunity to push the limits and help educate others about the extraordinary healing abilities of dogs. It is our hope that the information gained during this project will shed more light on the influence dogs have on the physical and emotional well-being of humans. The premiere is scheduled for March of 2019. Click here to get on board, and join Surf Dog Ricochet's mailing list! ​Surf Dog Ricochet has received many awards including the prestigious AKC Award for Canine Excellence, The American Humane Associations Hero Dog Award, and Dog of the Year from the ASPCA. She is also in two surfing dog halls of fame. You can see complete coverage of her awards at this link, or see the lists below. 2010 Helen Woodward Surf A Thon, 1st place "Top Fundraiser".